Discussion in 'General Discussion' started by BlakeConor14, May 31, 2018. 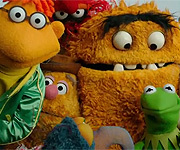 Hey guys I've started a blog called Confessions of a Muppet Freak. I'll be posting every Thursday or Friday evening. Interesting list you have of the movies. Are you going to talk about Sesame Street? What Elmo’s World clip did you see? Go to YouTube, and type Forgetful Jones Oklahoma, Wet Paint, and Kermit and Grover. You will tank me latter. Any Del, ConsummateVs, Froggy Fool and 1 other person like this. Also watch Grover and Mr. Johnson clips. Oh, and Bert and Ernie clips. Oh, and pretty much every clip from the 70s to the 90s. Any Del, LittleJerry92 and ConsummateVs like this. Would you also like me to upload every sesame street episode ever onto my youtube page? Any Del and LittleJerry92 like this. Naw the inserts are pretty easy to find and some of the more monumental street stories are as well. Look up Goodbye Mr. Looper and tell me you don't shead a tear, even if you don't know who Mr. Hooper is. Also lookup Christmas eve on Sesame Street, it is by far one of the best Christmas specials out there. Also watch Follow that Bird the characters are all perfect in this, and it was the last movie Jim prefomed Kermit in. I love that movie it will make you laugh cry and jump for joy. It has everything. It's kind of like the Muppet Movie for the Sesame Street characters and it is wonderful. Froggy Fool and ConsummateVs like this. 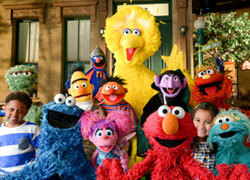 By the time this is all over we are going to make you into a Sesame Street fan! And look up different parodies Sesame Street made over the years. Song parodies, movie and TV show parodies as well. NTV with Nick Normal and the Nickmatics and any Little Jerry song. THUNDER. YOU CAN FOLLOW OUR SUGGESTIONS AS WELL.